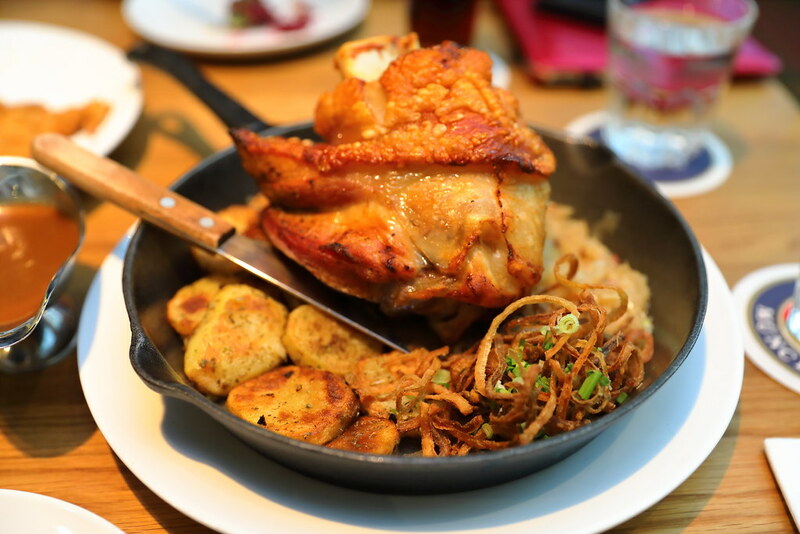 When we talk about crispy pork knuckle, sausages, German beers, there are only that many that we could think of. However, residents of River Valley just have another option since a year ago - Brez'n. located at Valley Point. 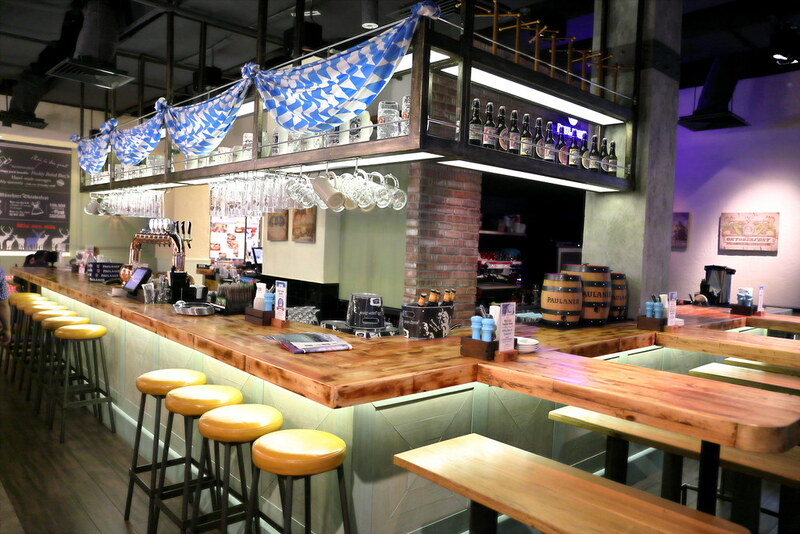 Brez'n offers you Bavarian cuisine alongside with beers imported directly from the leading Bavarian breweries, such as Paulaner. 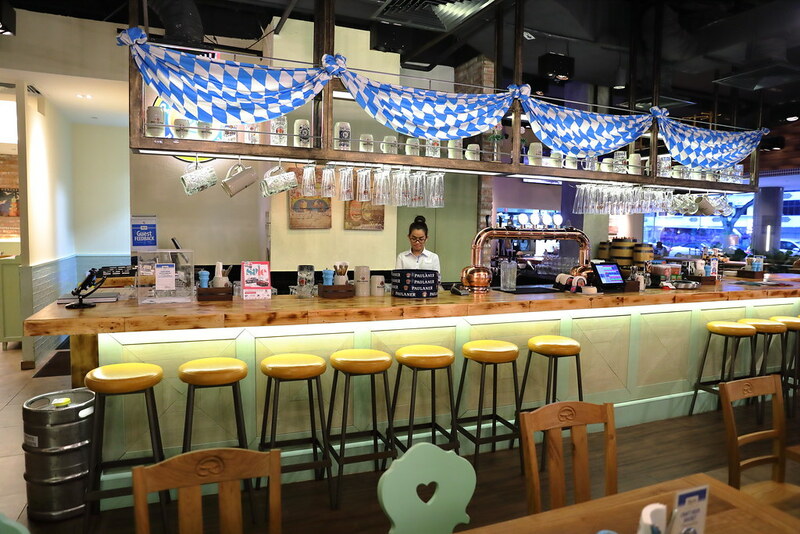 A closer look at Brez’n, the name itself is actually Bavarian name for pretzels, which explains the iconic pretzel logo. The best part is, you get to savour that too! Done with a distinct Brez’n twist, Brez’n Sandwiches are a first for Singapore. We picked a simple classic Grilled Ham and Cheese Sandwich ($16). 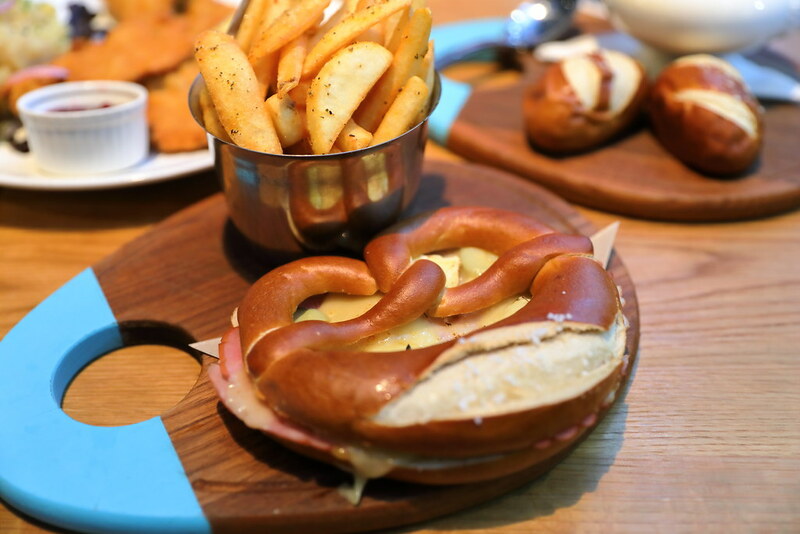 Oven–baked Brez’n pretzel with grilled Camembert and Emmental cheese, with honey glazed leg ham and pickled gherkins, the gooey thick cheese supports the chewy and dense pretzel nicely. What brings all these ingredients together is surprisingly the honey mustard spread discreetly on the bread. It greets my tastebuds with a tang and sweetness, giving the savoury sandwich a pleasant balance. 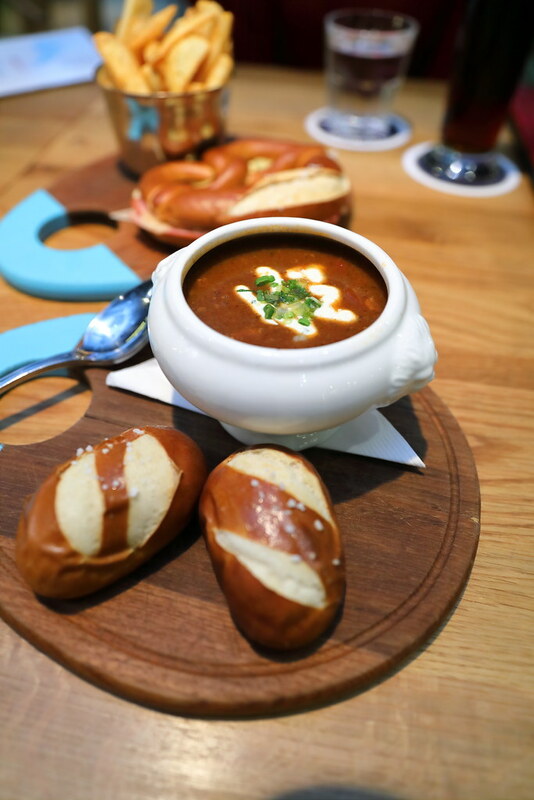 The satisfying bowl of Goulash Soup ($12) is something that I could come back anytime for it. I took on a liking for Goulash soup during my trip in Hungary and this definitely satisfies my craving. Loaded with potatoes and bell peppers, it is a little spicy and tangy, and it's thickness makes it just right for the two Brez’n buns served at the side. 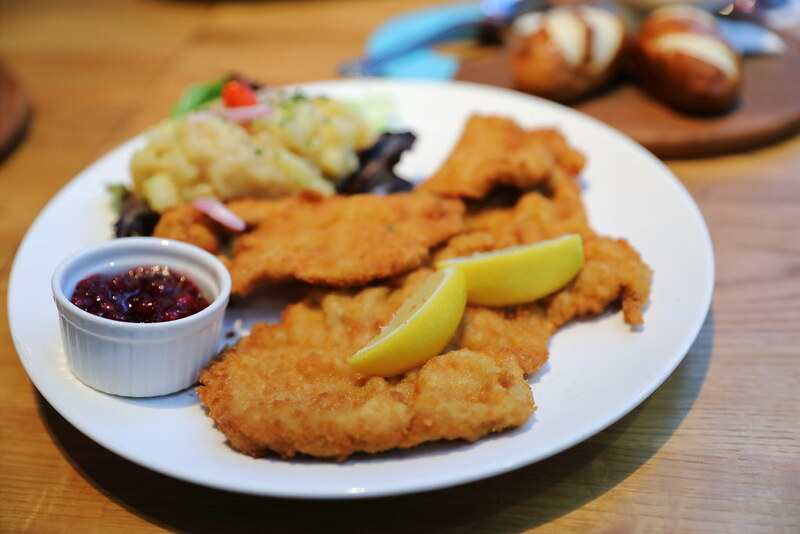 Adding on to the feast is Pan-fried Veal Escalope ($32). Though it appears pretty flat to me, the meat turns out to be a lot of more tender and juicer than I thought it would be, with a thin crisp crust. The tart cranberries compote makes it even more enjoyable. The potato salad at the side is fluffy and tangy, making it a rather balanced meal. 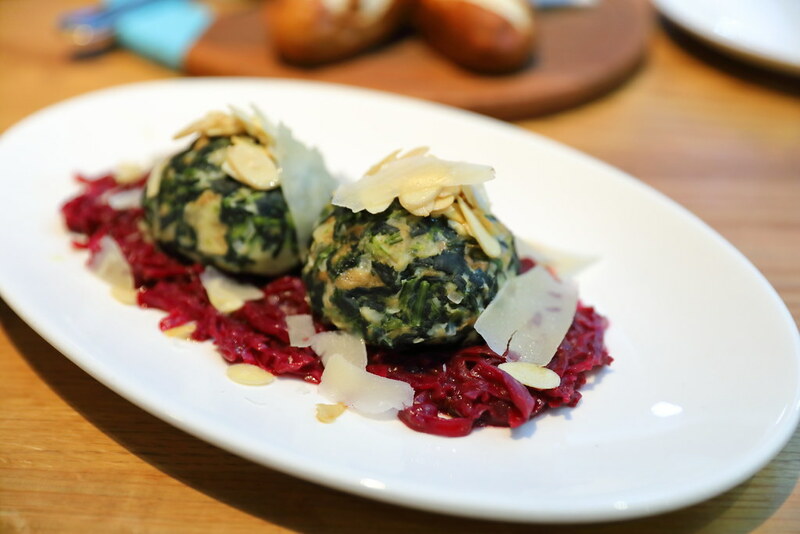 An unassuming dish worth mentioning is the Spinach and Bread Dumplings ($22) on braised red cabbage with butter roasted almond and cheese shavings. It's like having a Spinach Lasagne, being shaped and compacted into a ball. 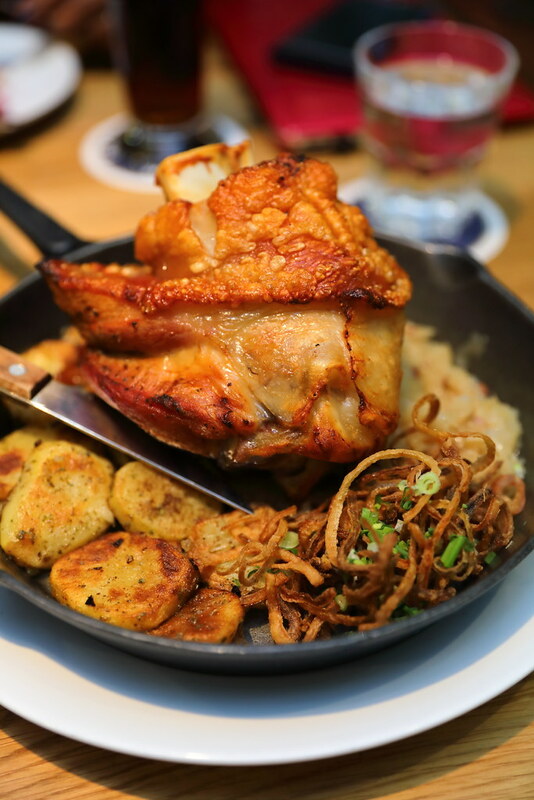 Not to be missed is of course it's signature Crispy Pork Knuckle ($29.50). I love how Brez'n does its pork knuckle. A homemade sauce has been injected into the meat before roasting to keep it supple when roasting, which explains the light pinkness in the meat. The crunch and flavour that the crispy skin delivers will just make you reach out for more and perhaps more beer too. The meat itself was quite tender with dark lager beer sauce to boost its flavour. The homemade sauerkraut has a pleasant acidity that cuts the richness of the meat and is far better than any that I have tried. Brez'n will be celebrating its first year anniversary soon! To mark the milestone and to give back to you diners, the Brez’n team has announced a total of 1,000 sure-win dining prizes up for grab when you dine at the restaurant between 1st and 10th September. 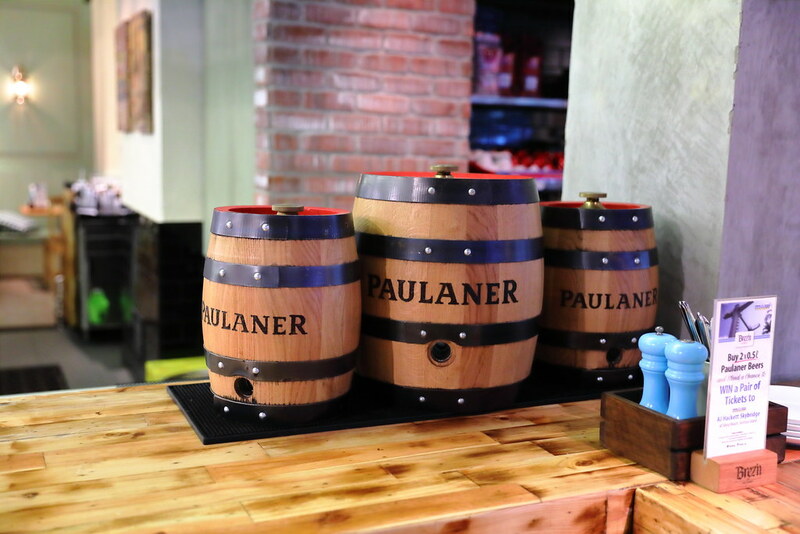 Prizes range from an entirely free meal to cold pints of Paulaner and many more! You can also enjoy a 10% off total bill by simply mentioning SG Food on Foot from 1 – 10 September 2017 to enjoy the discount. Words by Si An. A girl who is allured by travelling, loves the feel of freedom, smell of the rain and the aroma of fine coffee and food. Note: This is an invited tasting.